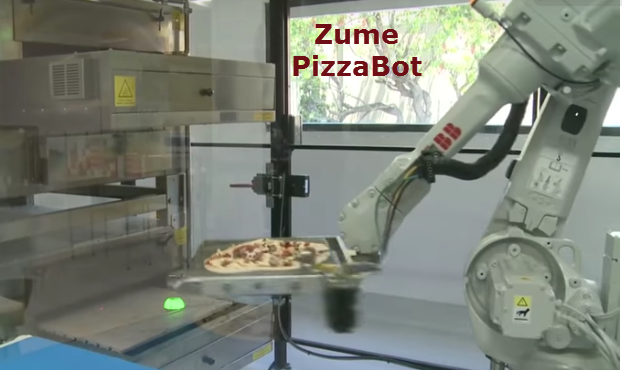 Robotics startup Zume Pizza aims to make your pizza while it’s being delivered, but it won’t be a human “chef” carefully placing your chosen toppings and popping it into the oven on the go – a robotic arm will do the job. The company recently raised $48 million in venture funding. Why would investors put in that much money into a pizza company, even though it involves automating the production process? There are several reasons why. First of all, the plan is to make the pizza while it’s being delivered. That means making time is built into delivery time. By the time the truck gets to your location, the pizza is just fresh out of the oven and piping hot. But that’s not the biggest reason. The real reason is that such automation could revolutionize the pizza industry. Domino’s is already experimenting with pizzas being delivered in a self-driving car. It’s a small project at the moment and only involves one car, and there’s a safety engineer doing the driving for now. But Domino’s is testing out the delivery process, giving customers an access code that they can use to open a special compartment that will only contain their order. Things are in very early stages with Domino’s project, but think about the synergies of robot-made pizza delivered by self-driving cars. It’s more efficient, more accurate, more volume can be handled in a given period of time, and so much more. The other factor is that labor and compensation costs have been on the rise for a while now. Automating the process in any industry can stabilize ongoing expenses and arrest any future compensation costs. Moreover, pizza-making is a relatively low-skill endeavor made up largely of repetitive tasks. As such, it makes the perfect testing ground for labor automation. Zume joins a slew of companies that are looking at the food space as an ideal playground for automation using robots. Chowbotics has a salad-making robot called Sally; Moley Robotics has a two-armed robot chef that’s going on sale next year for a very reasonable $15,000; Flippy the hamburger flipping robot just got a job at Caliburger. Things are changing in the world of food service, and companies like Zume are picking up millions from investors so they can get their product to market quickly, before the competition wakes up. Zume’s method is to use an assembly line to start off the process, but the pizzas are cooked on the way to their final location. That’s what makes this particular service unique, and worth another round of funding to the tune of $48 million. Zume picked up $23 million on its first round in December 2016. Notably, Zume doesn’t make the actual robots. these are provided by ABB, an industry leader in commercial robots. Zume simply puts it all together as a pizza production and delivery service. Robotics is the future, and the sooner we recognize it the better off we’ll be. Jobs will be lost and industries will be upturned, but the juggernaut of progress will stop for nothing. It’s already started happening. Bots are handling customer service; robots are working in warehouses where human workers used to be; factory workers are being replaced by robots; even robosurgery is on the rise for everything from vision correction to knee replacement. Is Artificial Intelligence about Taking Human Jobs or Creating Them? What is the Future of Work? Definition of Artificial Intelligence: What is AI, What are the Types and Components and How Does it Work?